No Highlands Trail map available at this time. 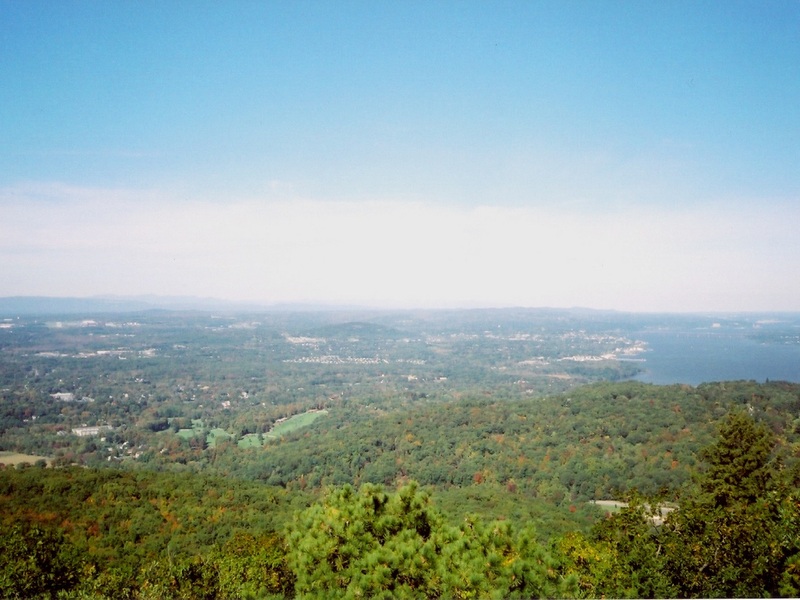 See "West Hudson Trails" map in our map store. Length: 27.9 miles Click on the icon in the text below for photos. 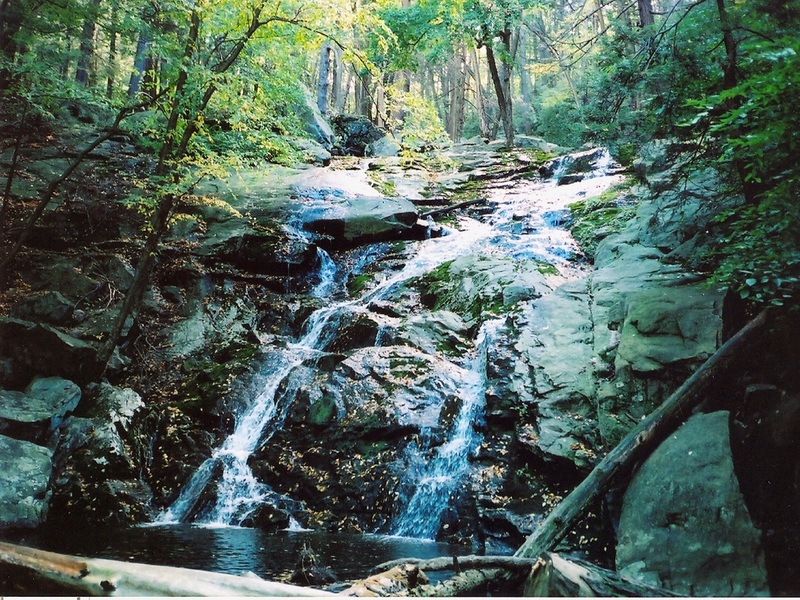 To hike in Black Rock Forest, organized groups should contact the Forest at 845-534-4517 in advance. There is no entry to Black Rock Forest or Black Rock Fish and Game lands during deer-rifle season (mid-November through early December). The Highlands Trail starts at the bottom of Dock Hill Road at the CSX RR crossing by the Hudson River in Cornwall, NY. Parking in this area is available to Cornwall residents only, and is strictly enforced. Follow the blazes uphill on Dock Hill Road .3 miles, turn at first left on Dock Hill Ave. for .1 mile, and come to Route 218 (Bayview Ave). The trail head is across Bayview Ave from the intersection. At .7 miles, reach a hiker parking lot, where parking is available. 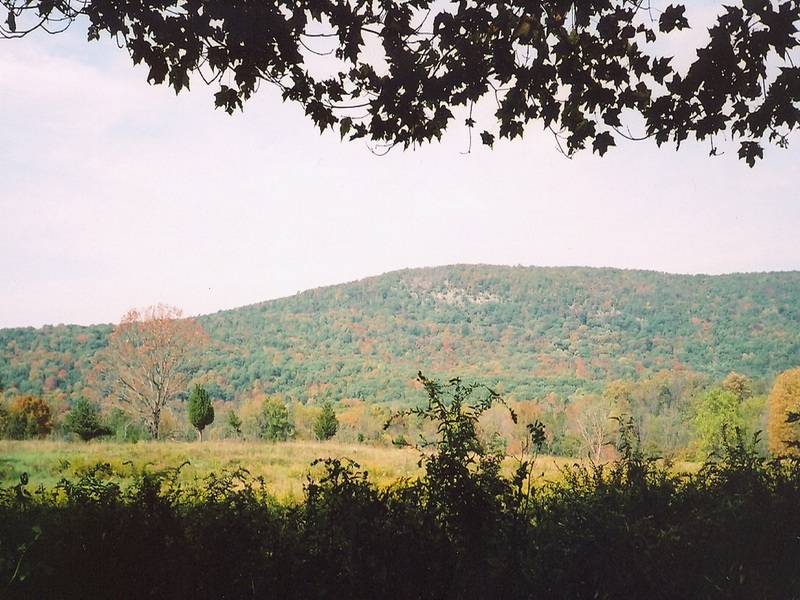 Follow the trail along fields, up Storm King Mountain along a stream, and past some view points to a junction with the yellow-blazed Stillman Trail at 1.4 miles. Proceed along the co-aligned the Stillman (yellow) and Highlands Trails over Storm King Mountain, then back down the mountain to a driveway that leads out to a left turn on Mountain Road at 4.4 miles. After a short distance turn left off of Mountain Road and pass through a tunnel under US 9W. Walk to the Black Rock Forest parking lot on Reservoir Road at 4.8 miles. Turn left uphill across the street from the parking area, still on the co-aligned Stillman and Highlands Trails. 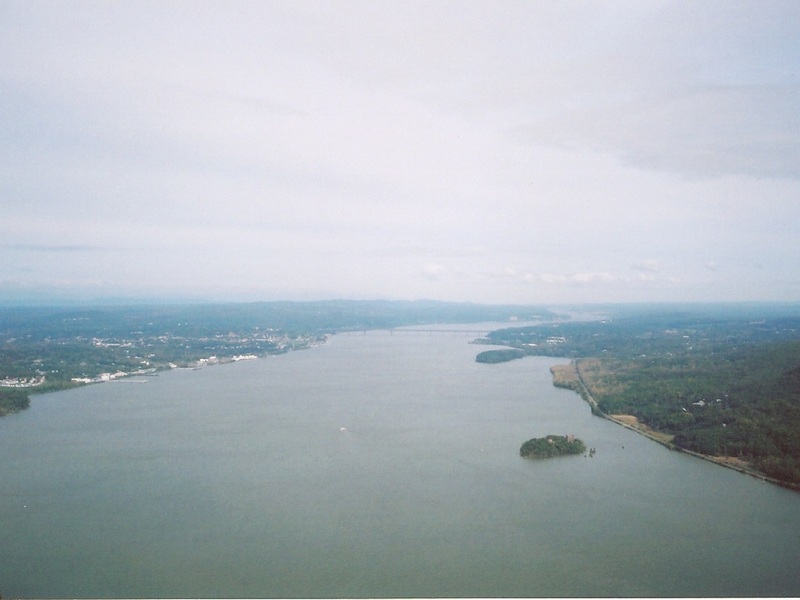 Pass the Upper Reservoir, climb over steep Mount Misery and Black Rock. At 9.1 miles reach a junction where the Stillman Trail and the northbound Compartment Trail (blue) go off to the right, and the co-aligned southbound Compartment Trail and Highlands Trail continue straight ahead. In another 0.6 miles the Compartment Trail ends at a 'Y' junction with Jim's Pond Road. The Arthur Trail (yellow) begins here and follows Jim's Pond road to the left. Turn left onto Jim's Pond road. Stay on the road when the yellow blazes leave the road to the left. After another 0.1 mile (9.6 miles from the start) turn right following the co-aligned Scenic (white) and Highlands Trails. Continue mostly downhill, passing a waterfall and shortly reaching Old Mineral Springs Road. Bear right on Old Mineral Springs Road and follow it about 500 feet down to Mineral Springs Road. The Scenic Trail ends here. 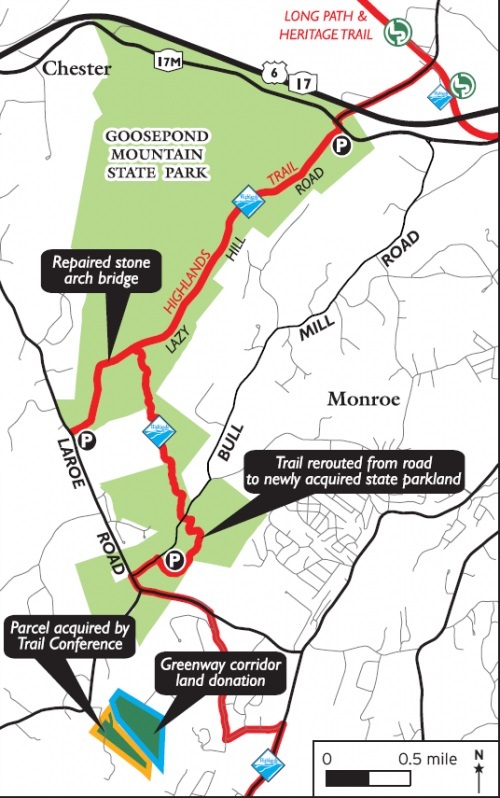 Alert: Due to a dispute with a property owner, there is currently no access to the next section of the Highlands Trail from Mineral Springs Road. A temporary road walk has been blazed. To reach the next section, make a right on Mineral Springs Road and walk 1.3 miles to Angola Road. Turn left on Angola Road and walk .9 mile down to Route 32. Cross Route 32 and walk down Pleasant Hill Road. Cross the New York State Thruway, reaching the Schunemunk Trails parking lot at 14.4 miles. Across the street from the parking lot, follow the co-aligned Jessup (yellow) and Highlands Trail for 8.6 miles along the ridge of Schunemunk Mountain. Along the way, the Long Path joins the Jessup / Highlands Trails. 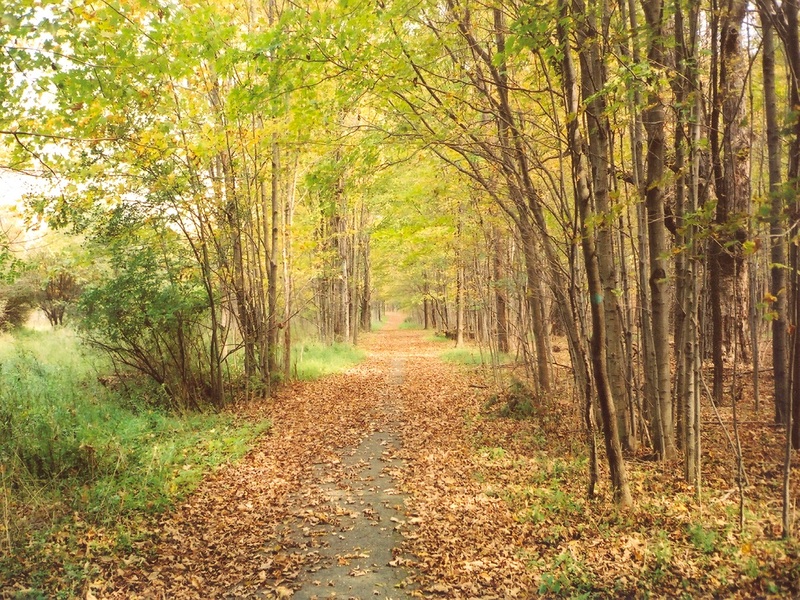 Follow these trails down to the closed portion of Seven Springs Road. The Jessup Trail ends here. Turn right onto Seven Springs Road. Follow the co-aligned Highlands Trail and Long Path 0.5 mile past an area where parking is available and down to a gate at Mountain Road. Cross Mountain Road and continue on Seven Springs Road, turning right off the road in a residential area. Proceed through the woods and up and over a ridge on the co-aligned Highlands Trail / Long Path to cross NY 208 at 24.0 miles. 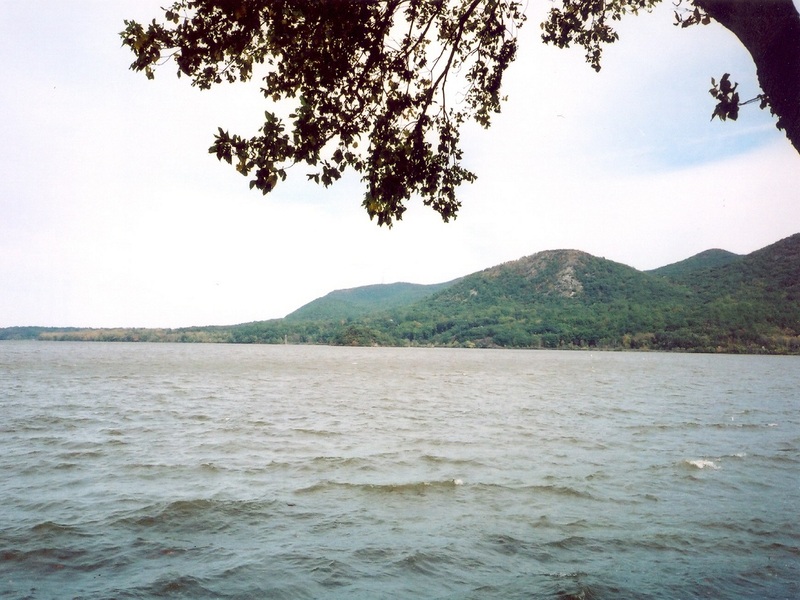 Follow the shore of Orange-Rockland Lake, then turn left onto Museum Village Road, following it across NY 17. Turn left, reaching a commuter parking lot at 24.6 miles. Turn sharply right onto the Orange Heritage Trail, formerly the Erie Railroad mainline, and proceed for a mile, crossing back under NY 17. Turn right off of the Orange Heritage Trail on the Highlands Trail (the Long Path continues straight) after a small cemetery on your right and just before a bridge and go down the embankment to the road. Make a left under the bridge onto Craigville Road (County 51), following it to NY 17M at 26.3 miles. After a quick jog across 17M, turn right onto Lazy Hill Road, an abandoned, formerly paved road. Follow this through Goose Pond Mountain State Park, reaching Bull Mill Road at 27.9 miles, where there is parking.